Skippy was trained by his owners Henry East and Gale Henry East, and also by Frank Weatherwax and assistant trainers Rudd Weatherwax and Frank Inn. In 1936, Skippy and several other movie dogs were profiled in the book Dog Stars of Hollywood by Gertrude Orr. At the time Skippy was said to be four and a half years old, giving him a birth year of 1931–32. He was said to be one of the most intelligent of animal stars then working in pictures. In addition to verbal commands, he also worked to hand cues, essential for a dog performing in sound films. His training began when he was three months old, and he made his first professional film appearances at the age of one year, in 1932–33, as a bit player providing "atmosphere." In Orr's book Skippy was shown in a series of publicity shots with Wendy Barrie in It's a Small World, Mae Clarke in The Daring Young Man and Mary Carlisle in an unidentified film. He became a star overnight in The Thin Man (1934). 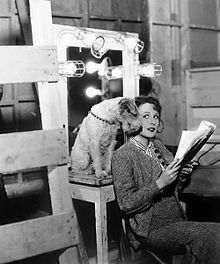 In Bringing Up Baby (1938), Skippy played "George," the bone-hiding pup belonging to Katharine Hepburn's aunt. In Topper Takes a Trip (1938), he was "Mr. Atlas". Movie actresses stroke Skippy lovingly. They coo at him and murmur endearing terms in his ears. He takes it all in his stride, because, what with contracts, options, and exacting work before the movie cameras, he hasn't much time for the attentions of Hollywood's most beautiful stars. But if he's paid for it and given the proper cue he will snuggle in the arms of the loveliest of stars, gaze into her limpid eyes, and, if necessary—howl. Skippy, a smart little wire-haired terrier, is one of the leading stars in pictures. He leads a glamorous life—a dog's life de luxe. He is rated as one of the smartest dogs in the world, and when contracts are signed for his appearance in a picture he gets $200 a week for putting his paw-print on the dotted line. His trainer gets a mere $60. His owner is Mrs. Gale Henry East, once a prominent movie comedienne...When Skippy has to drink water in a scene, the first time he does it he really drinks. If there are retakes and he's had all the water he can drink, he'll go through the scene just as enthusiastically as though his throat were parched, but he'll fake it. If you watch closely you'll see he's just going through the motions of lapping and isn't really picking up water at all. And, because he has a sense of humor, he loves it when you laugh and tell him you've caught him faking but that it's all right with you. "Treat a dog kindly and he'll do anything in the world for you." At a time when most canine actors in Hollywood films earned $3.50 a day, Skippy's weekly salary was $250.00. 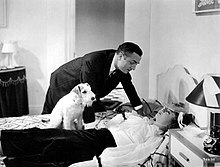 As a character in the movie The Thin Man, Asta was the playful pet dog of Nick and Nora Charles, tugging them around town on his walks, hiding from danger, and sniffing out corpses. ("Asta, you're not a terrier, you're a police dog," Nick tells him.) The character later appeared in the sequels After the Thin Man, Another Thin Man, Shadow of the Thin Man, The Thin Man Goes Home, Song of the Thin Man, as well as the 1950s television show The Thin Man. The original character of Asta in Dashiell Hammett's book of The Thin Man was not a male Wire-Haired Fox Terrier, but a female Schnauzer. 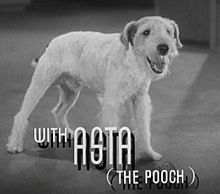 Due to the enormous popularity of the Asta character as played by Skippy, interest in pet terriers skyrocketed. Asta's enduring fame is such that the name is a frequent answer in The New York Times crossword puzzles (crosswordese), in response to clues such as "Thin Man dog" or "Dog star." Skippy played Asta in the first three Thin Man films. Other terriers, trained by the Weatherwax family and by Frank Inn, took on the role in subsequent films of the series, and in the television show. ^ a b Griswold, J. B. (August 1938). "A Dog's Life in Hollywood". The American Magazine. Crowell Publishing Company. 126 (2): 16–17, 60, 62. ^ a b c Orr, Gertrude (1936). Dog Stars of Hollywood. Akron, Ohio: The Saalfield Publishing Company. OCLC 14234925. ^ "Animal Movie Star Trivia". TCM Film Article. Turner Classic Movies, Inc. Retrieved February 12, 2018. ^ Kotsilibas-Davis, James; Loy, Myrna (1987). Myrna Loy: Being and Becoming. New York: Alfred A. Knopf. ISBN 9780394555935. ^ a b c d e f g h i j k "Asta". AFI Catalog of Feature Films. American Film Institute. Retrieved 2015-12-01. ^ "Skippy". British Film Institute. Retrieved 2015-12-01. ^ "Famous Movie Dogs". Internet Movie Database. Retrieved 2015-12-01. ^ "Famous Movie Dogs". Turner Classic Movies. Retrieved 2015-12-01. ^ "Asta II". AFI Catalog of Feature Films. American Film Institute. Retrieved 2015-12-01. Wikimedia Commons has media related to Skippy (dog). This page was last edited on 29 October 2018, at 23:19 (UTC).